Roaring Brook Press, 9781626720985, 32pp. From the cranberry bog to the Thanksgiving table, join Sam and his family as they harvest a classic American fruit. When the vines hang heavy with berries that the autumn winds have turned deep red, it's time for cranberries, and Sam is finally old enough to help with the harvest! This charming, lyrical picture book follows Sam and his family as they raise the water in the bog, pick the cranberries, and gather the fruit for processing. It's a story of modern family farming in action, showing readers where their food comes from but mostly delighting them along the way. Lisl H. Detlefsen lives on a family-owned cranberry marsh in central Wisconsin with her husband and two young sons. 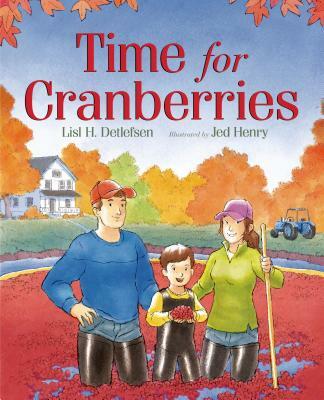 Time for Cranberries is her debut picture book. Jed Henry has illustrated many wonderful books for children, including his own Cheer Up, Mouse and I Speak Dinosaur. He lives in Provo, Utah with his wife and daughter.